This module is taught by flying expert Laura (Sykora) Kasperzak. Laura is a world renowned yoga instructor who specializes in inversions and partner yoga techniques. She has over a million followers on Instagram who love to watch her take her practice to new levels. This module explores variations of traditional yoga poses and flows that can be adapted to partner yoga techniques. 1. Sequences to warm the body appropriately for advanced techniques. 2. Spotting, communication, and proper alignment. 3. Taking your techniques to new heights through partner yoga maneuvers. *In addition to class hours students will be required to submit a video project in order to receive their 25 hour certificate. What is your experience with partner yoga? Have you ever taken any workshops or trainings that emphasize partner work? Are you aware that you need to attend all sessions and complete all assignments in order to receive your 25 hour certificate? 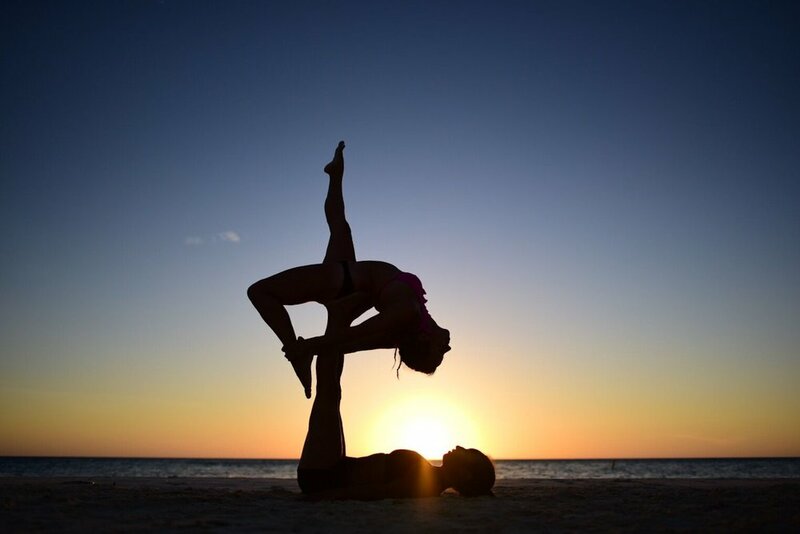 Partner yoga is physically demanding and requires participation in all practice sessions. Are you physically capable and in good health to complete these sessions? This module is non-refundable. If you are unable complete the hours you will be able to take the module if and when we offer it again for a discounted rate of $175. Please type yes in the text field that you understand the requirements and the course completion policy. Thank you! A representative will be in touch with you via email to schedule a short phone interview.